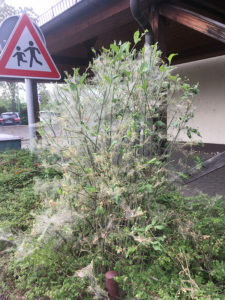 GRAFENWOEHR, Germany — Sightings of web covered shrubs with clusters of yellow and black spotted caterpillars around the garrison and residential areas have raised some voices of concern, but community members don’t have to worry about this particular caterpillar. These native caterpillars are Spindle Ermine Moth larvae (Yponomeuta cagnagella), or Pfaffenhütchen-Gespinstmotte in German. They do not pose a risk to the public, or to the plant they claim as home during their larval and pupal stages. The habitat and food source of the spindle ermine moth is the European spindle shrub, found along forest edges and hedges. Locally, this plant can be found in places such as the vegetation lining the sidewalk of the Tower Barracks post office and circumference of the Physical Fitness Center track. 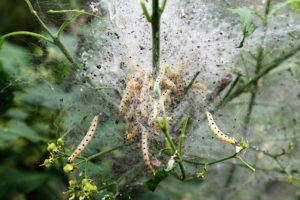 The plants can be seen covered in the caterpillars’ webs and mostly defoliated, as they eat the leaves and bark in preparation of spinning cocoons. The life cycle of the spindle ermine moth begins the summer prior when a female moth lays eggs on the branches of the European Spindle shrub. In a few weeks, the larvae hatch, eat briefly, and then hibernate through the winter. In the spring, the plant will begin to grow leaves, bringing out the caterpillars and their webbings. During their larval and pupal stages, the Spindle Ermine Moth use webs as a protective barriers. As larvae, they eat the leaves. Then as pupation to moth begins, they spin silk cocoons to hang inside the webs. Emergence occurs in June, where elongated white and black spotted moths take flight to begin the next generation cycle of mating and laying eggs. The moth lifespan is short, usually perishing by October. 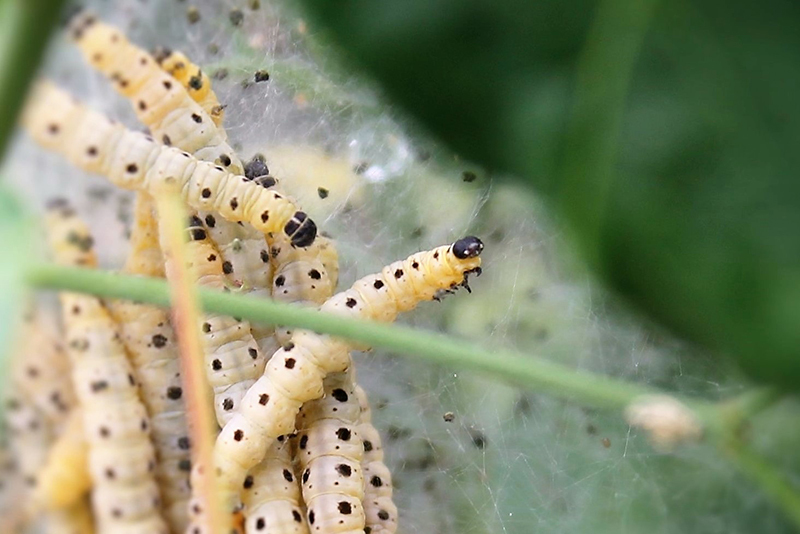 The U.S. Army Garrison Bavaria Environmental Division says the spindle ermine moth caterpillars should not be confused with the oak processionary moth caterpillars, whose hairs are harmful to humans and pets. The two species of moth can usually be identified from the tree or shrub where the caterpillars are found and their contrast in appearances. If a mass of caterpillars is spotted, and identity cannot be determined, please do not attempt to destroy them. Doing so may cause a person and the caterpillar unnecessary harm. Instead, you may submit photographs with location descriptions to the Environmental Division’s Facebook page to be reviewed. If appropriate, guidance may be given for whom is authorized to handle removal or if they can be left to thrive. Additional contact information for the Environmental Division can be found on the garrison page www.bavaria.army.mil/environmental.